A private asylum operated in Barford from 1833 until the early 1850s. There is still some ambiguity as to which house the asylum was located in. In an 1846 advertisement it clearly states that it was in Watchbury House. In the Warwick Record Office there is a plan of the asylum, dated in the late 1840s, with the name Ivy House crossed out and Watchbury House substituted. This plan does not depict either Ivy House or Watchbury House! The first licensee of the Barford Asylum for ‘the reception of mental and nervous invalids’ was Thomas Morris. The license was issued in October 1833 for eight patients. The Register for Insane Persons shows that the patients came from a wide area, all over England and were also of a wide age range. Men and women were admitted. 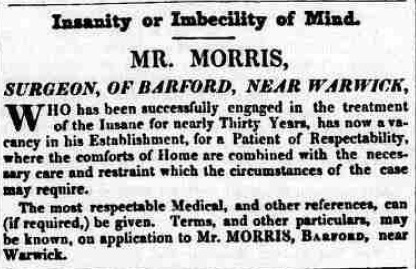 In an 1841 newspaper advertisement ‘insanity and imbecility of the mind’, Thomas Morris describes himself as ‘surgeon of Barford near Warwick’ but a search of records of surgeons and apothecaries of the early 19th century could not confirm this. Mr. Morris states that he has been successfully engaged in the treatment of the insane for thirty years and that his Barford Asylum combines the comfort of home with ‘necessary care and restraint’. Thomas Morris, aged 40, of Hammersmith, was appointed as Principal Superintendent to the County of Nottingham Asylum in 1811. He was paid £100 per year for this and his wife, Anne, was appointed as Matron on a salary of £30. The couple continued in this post until 1827 when they took up a similar appointment in Derby. They both remained in this position until they came to Barford. His successor, in Barford, was Annie Hebert. 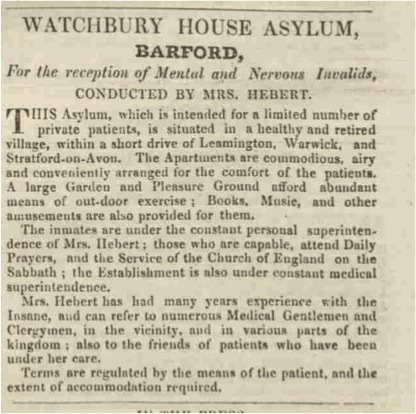 Mrs. Hebert was already well known for the care of the mentally ill in Warwickshire. Her 1846 newspaper advertisement offers treatment consisting of abundant means of out-door exercise, books, music and other amusements, such as daily prayers and the service at St. Peters Church on the Sabbath. The apartments in the asylum are described as commodious and airy. In 1848 Dr. Ralph Augustus Busby was appointed Medical Attendant to the Barford Lunatic Asylum but we have no record of his taking up this appointment. 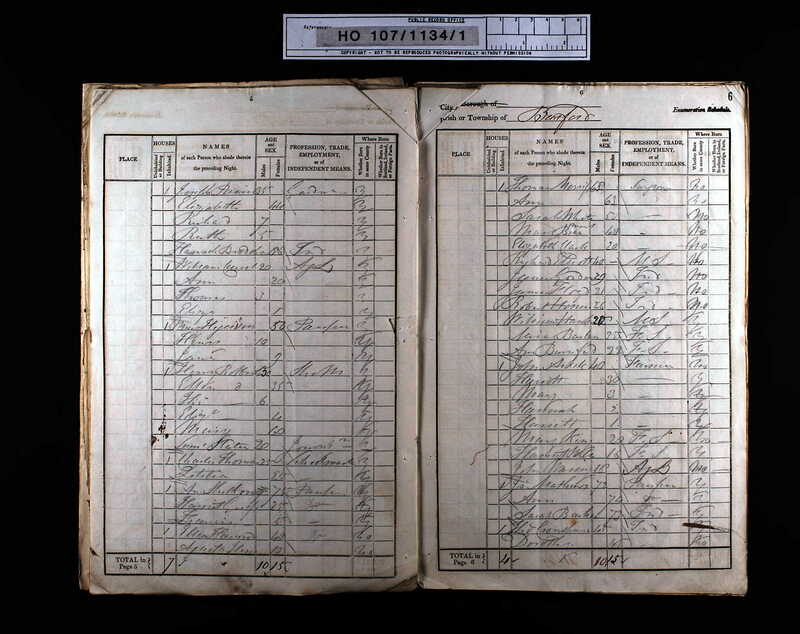 This appointment was made at the same date that the new plans for the asylum were drawn. Thomas Morris retired to Warwick in 1842. Geoffrey and Carole Henderson, Geoff is presently writing a biography of Lewis Way. This page was added on 15/02/2015. Really interesting to see what was going on locally at this time. I wonder whether any of the patients treated at Barford Asylum had any experience of the care at Hatton, Warwick?